This first recipe in my tropical island trio is a simple and delicious fruit salad combo. It’s a refreshing accompaniment to spicy Caribbean jerk (yes, #2 in my trio will be a jerk recipe). What makes this salad unique, other than the fruit, is allspice and ginger in the dressing. Both spices are common throughout the Caribbean, as are many other spices that we typically think of for baked goods — nutmeg, cinnamon etc. Also, you can see in my photos that mangos and papayas vary in color from yellow to orange depending on their country of origin, variety, and ripeness. Combine seasoned rice vinegar, brown sugar, and generous dashes of allspice and ginger; stir to dissolve sugar. 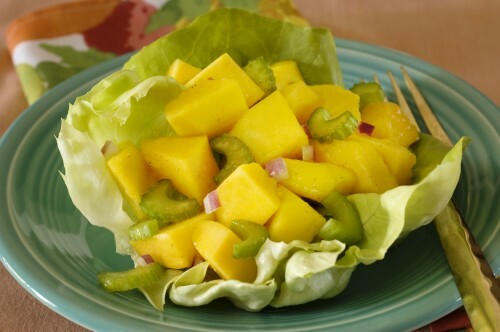 Cut mango and papaya into cubes. 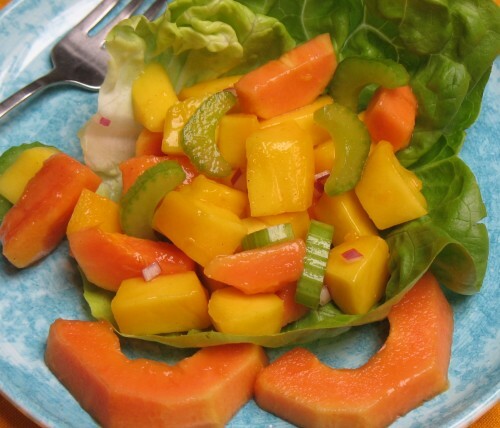 Use about 4 cups fruit for this salad. Combine fruit, celery and onion in a medium bowl. Pour dressing over fruit and stir. Serve in individual lettuce cups. I might not do that, LOL, but it would be great with a quinoa pilaf. Same thing, right? Ahh… sure it’s the same as jerk :o) Btw, #3 in my trio will be authentic sofrito, the Puerto Rican way.